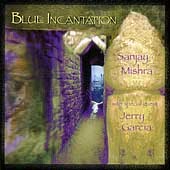 Blue Incantation is an exceptional collection of instrumental pieces from guitarist Sanjay Mishra, and its success goes far beyond the assistance he received from Jerry Garcia. Considering its aesthetic style, it is in many ways an Indian version of Merl Saunders' Blues for the Rainforest. Garcia appears on three tracks: Monsoon, Clouds (to Jerry Garcia), and Nocturne/Evening Chant. These are certainly the best tracks on the disc simply because the interplay between the two musicians is phenomenal. Yet, Mishra is an outstanding guitarist in his own right. At times, his approach is similar to Garcia's. During other passages, he makes his guitar sound like a sitar. He is more than just technically competent, too. Throughout Blue Incantation, he brandishes a range of emotions and feelings that are difficult for many guitarists to capture. Fans of musicians from Merl Saunders to Béla Fleck will love this disc. Blue Incantation is available from Barnes & Noble.